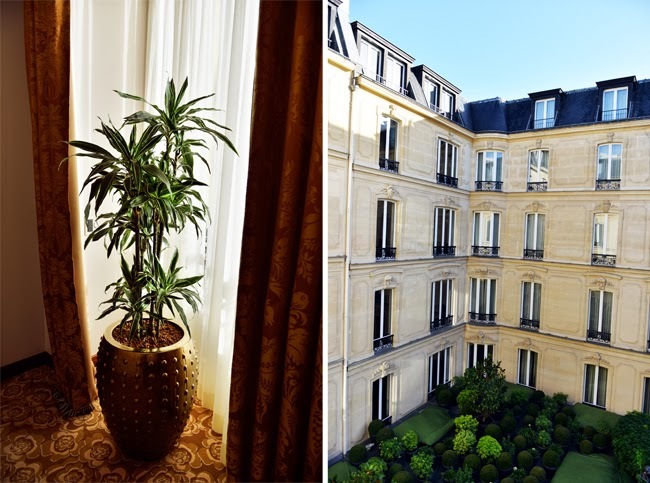 LUXURY ESCAPE IN PARIS Before talking about the wonders that James and I have prepared for this article and our incredible stay in Paris at the hotel Fouquet’s Barrière I wanted to tell you guys how much I’ve missed you all!!! Even though I’ve wrote and article on New Year’s Eve wishing you all a super happy beginning of 2014, I had the pleasure to enjoy some “holidays” far away from my computer for several days. So no posting on the blog… but I still had to catch up on my favourite TV shows (Revenge, Big Bang Theory, HIMYM here I come!!!). There were some mornings where it almost felt kind of weird as I was the first one to head onto Kayture to make sure that the new article is properly online. Several times, I did have to tell my self, girl, you got to relax : no posts on Christmas holidays. Also a great thing is that you’re not the only one on holidays! Most of our partners and friends were too, so no risk of missing any e-mail or having to hop on this quick call while you’re having a lunch with your folks. I’ve been enjoying some time with my family and have been literally hibernating for a couple of days. I had the big pleasure to spending some quality time at home, without going out and to be totally honest it’s one of the best things ever. I’ve been working religiously on music for months now so having the chance to have some free time to practice and write was just amazing. I’ve got several songs that are ready, some are almost finished but I can’t wait to share with you more about this new adventure. I’ve also been preparing some new articles and looks for Kayture, as well as filmed some new videos for the blog which will be hopefully be released as soon as possible as well! With all of that being said, I am back in force and with bags of motivation and energy ready to bite in year 2014 as if it was a juicy fruit of the gods. And here we go with this first article of 2014 about our amazing experience at our new parisian home away from home : the hotel Fouquet’s Barrière. Not only is it the spot where Beyoncé and Jay-Z stay when they are in France (talk about a high quality standard…) but it’s also the place where we stayed during last Paris fashion week (and we’re also cool, so that makes sense… I hope!). Since James and I are so into lifestyle, there’s one thing we pay attention to more than anything else and it’s definitely the service : the team, the staff, the little details and attentions. We couldn’t be welcomed by a friendlier staff and oh my holy grail of heaven how incredible is the food. If France is known for it’s culinary skills, well the Fouquet’s Barrière most definitely confirms the rumors. The menu is super gourmet but also full of healthy choices perfect for a nice lunch break. I definitely suggest the salmon fillet, which is probably the best one I’ve ever had. Like ever (okay I am hungry now). The rooms are super cozy and sweet, they have that old movie kind of feeling which makes you feel like some kind of diva while getting ready to head out in town. This is the first part of this awesome high style experience, make sure to stay updated for the second part of the adventure! This is such a beautiful top! Love the color! Just gorgeous! Great way to kick off 2014 and happy to hear you got a break from blogging. Beautiful look. Esp. love the top. Can't wait to hear you sing. This hotel is really amazing, and french food is a high quality where is hard to be disappointed. I can't wait to read your next adventure. Amazing article and photos as always. estás guapisima Kristina!!!! feliz año! I love this look, definitely the bracelet and the 2 bags! The hotel looks amazing! Great photos, but I feel like they're too much retouched..
You look so pretty! Such an amazing place! I really love your make up! Always! Gorgeous post and incredible photos ! It looks so perfect overthere and your look is stunning! Beautiful photos, love your top ! Seems like a lovely place to visit! wow, what an amazing hotel!! this green sweater is to die for ! Thank you for that review! The hotel looks very elgegant and the food seems just amazing!! I wish you a happy new year and I am looking forward to new articles! U look beautiful! Amazing top! Très belles photos. J'aime beaucoup le haut de ta tenue, original ! That top is really beautiful ! You look like a doll here Kristina! beautiful post! happy to see you back! Beautiful photos and outfit, as always! Love the little Alma bag! wow, cozy shirt. nice combination. i love the green and i am super excited for 2014! Beautiful outfit! So chic and cute! I'm so jealous!!! Its look so nice there ... love all those pic. What is the colour of your lipgloss? Lovely pictures! You look absolutely gorgeous as usually! I love how you always have a perfect makeup. Do you do it yourself? You look lovely as always, they pictures are perfectly shot! you look great in all these pics! Thanks for sharing about your hotel experience, I hope to visit there one day! These photos are amazing, I love the color of your sweater, it looks great on you! Stunner! That bracelet is divine! I want to wake up in a pplace like this... so luxury! and your sweater is so stunning! Amazing photos :) You look gorgeous :) Love it ! Are unable to hold out to check out doing this fresh tasks you're always dealing with. You're always expressing the amount of you love songs in addition to just how you're receiving so needed for it lately nonetheless Post essentially get never notice you singing it really is with regards to occasion, is not it. un beso desde España y felis año!